Since I wrote recently about how I dreaded situations where I might be forced to wear t-shirts, someone asked me what else was on my list of phobias. It is short, the list of things I dread. I’m not a fearful person. But here are some other things I try to avoid. I don’t mind real smiles, and I suppose there may be a “real” smiley face. But I try to avoid getting stuck in elevators or conversations with sweet, syrupy people. And while I can handle an emoticon or two, they seem like poor substitutes for better words or richer contexts. Some people talk with smiley faces, everlasting cheerleaders in an ever-ending high school. The thing that annoys me in type as much as smiley faces, and even more than ALL CAPS, is multiple exclamation points!!!!!. And by extension, the people who make them in conversation. I’m uncomfortable around loud people and usually the opinions that come with them. Nothing is ever true because you say it more often and with more emphasis. Both the people who talk too loud or who smile too much are likely to show up at places where you are required to wear name tags. I could do a whole post on the problem of name tags, but I’ll spare you. Today at least. Let’s just say, if you want to know my name you should ask me. I don’t even mind if you forgot. I probably forgot yours too. But you don’t know me if you just read my name. 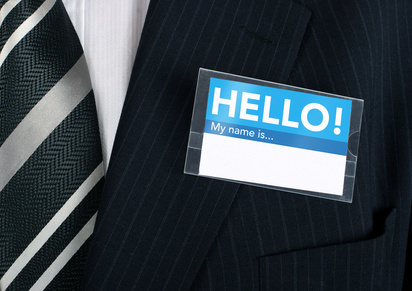 Name tags often spark very superficial conversations when what we need are real ones. These are the events where you have to wear name tags and hang out with people who use too many exclamation points or smiley faces, eating small food and talking about small ideas. I hate mixers. I know it sounds like I’m antisocial, but I’m actually just more introverted than people assume, given my many public responsibilities. I’m getting better at these events, however. Even my wife would say so. In fact she has taught me how much more important it is to sit and have one or two conversations that matter rather than many conversations that don’t. This is not easy. I was a quite, bookish kid, often either overlooked or mocked at school. By the time I got to college my defense was to talk too loud and tell too many jokes. In my worst moments I can still do this. And in my best moments I remember that those things I react to most are reflections of myself. So I’m learning to overlook the exclamation points and see the passions behind them. I can even recognize a smile, although I still react to people who laugh too much or love too little. The truth is I’ve always preferred observing people to interacting with them. I’m just glad that is not how God for Christ’s sake responded to me. And so becoming more gracious is my learning edge, the place I stretch and grow. I’ve found the world is filled with people who share my fears, just waiting for someone to speak to them or understand them, regardless of how loud or sweet they are or appear to be. Grace is a good thing and I’ve received a lot of it. It is in our weaknesses that we finally understand that. And it is in our vulnerability that conversations finally flourish. Love it. I am with you on the exclamation points. Oh dear, now I am feeling intensely guilty for every smiley face I have ever used (rare) and those exclamation points (usually singular not plural though) that have found their way sprinkled through my written words. I will endeavor to try harder so that I have less to feel guilty about. Have to agree with you about the name tags and mixers though. I will admit that my least favorite part of going to church every Sunday morning is when we have to stand up and greet all those around us who we may or may not know. Feel guilty about that too. . .
See there, I can use them with discretion. Feel less guilty, though. Grace is a wonderful thing. As an event planner, I have spent countless hours wearing name tags at big events. Here’s a trick: Wear it on your right lapel, not the left as most people do. That way, when someone reaches to shake your hand he can glance at your nametag surreptitiously, making it seem as though he really remembers you. And eventually, he really WILL remember you. And you’ll become friends. All those name-tagged people will become your friends. They will all share something of themselves with you, teach you something you didn’t already know, because they are all wonderful people made in the image and likeness of God. When you can’t think of anything to say, tell them about those wonderful books you’ve read. I haven’t unpacked all my name tag angst here. Part of it is people pretending to know or remember me. I don’t know if I’ll make a lot of new friends in environments like this. But I do try to listen more. They are, as you say, made in the image of God. Surely, small-talk can be a wearisome thing for those of us who lean more I than E. Have you ever just written a question mark on the tag? I suppose it might be a bit odd, but I know it would stick out to someone like me at a mixer who would prefer to have a meaningful conversation than a flighty one. Your mentioning of the world being filled with people who share your fears and are just wanting for you to talk with them and understand them really struck a chord with me in that I think this is a simple and profound truth. Stepping out into the unknown risks of vulnerability is a big undertaking for the introverted, but it is a worthwhile investment. Thanks for the courage. You’re welcome, by the way. Thanks for reading and responding. Thank you for this post . I agree most with the name tags. It’s always interesting to read your posts .